Indignation was directed by James Schamus, an award-winning screenwriter, producer and CEO of Focus Features for 13 years during which time the studio released such critically-acclaimed and commercially successful films, including: Dallas Buyers Club, Moonrise Kingdom, Milk, Eternal Sunshine Of The Spotless Mind , The Kids Are All Right, The Pianist, Coraline. Schamus produced Ang Lee's Brokeback Mountain, which won three Academy Awards. Schamus also received Academy Award nominations for Best Adapted Screenplay and Best Original Song for his work on Lee'sCrouching Tiger, Hidden Dragon. 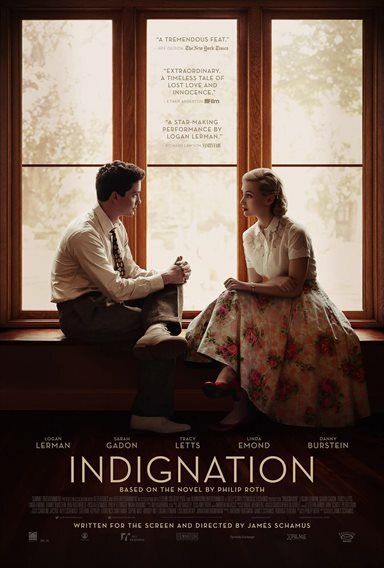 Download Indignation in Digital HD from the iTunes store. Indignation images are © Roadside Attractions. All Rights Reserved.